Album: Will the living corpse have dream of tomorrow? This one had been in the works for a while, probably a year or so. You didn't know? The purpose of this blog is secretly to push the limits of time intervals between blog posts. Just got the motivation to finish it up today, so here it is! 一人になった君は？ Hitori ni natta kimi wa? What happened, when you were alone? どうか教えてよ　この声は届くの？ Dou ka oshiete yo, kono koe wa todoku no? Tell me! Does my voice reach you? 「...ほどに」 will usually mean "to the extent that ...". The doer is different between my interpretation and yours. I would translate that part to "When I scream up to laughing". I interpret this part as "When I scream loudly up to making me (and others) feel so strange and funny that I (and others) laugh" and suppose that it continues to the next line. I would choose not "you" but "I" for the doer of "dissappear". I suppose that this song is sung from Keine's perspective and 「君」 is Mokou because it says 「過去の物語の住人だった君と　過去の物語の語り部になった私」 and the original musics are 「懐かしき東方の血　～ Old World」 and 「プレインエイジア」, which are Keine's themes. 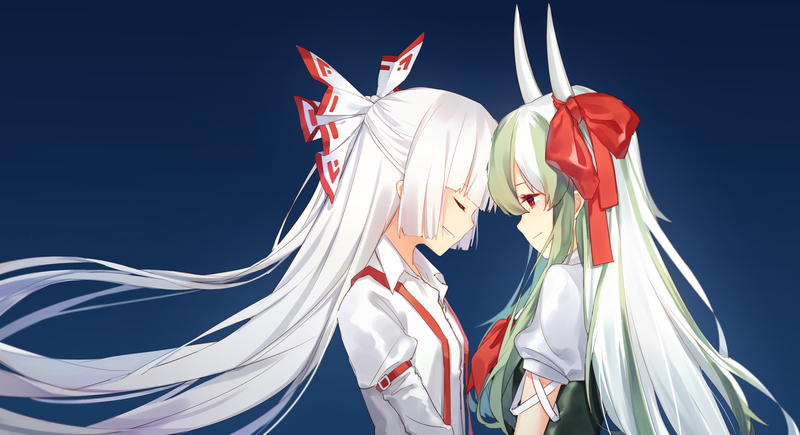 On that assumption, my choice is because Keine will disappear or die before Mokou, who is immortal. The lyrics sheet and 556t say 「叫んでも」, not 「叫んだら」. In the 4th stanza it goes 「叫んだら」. I would translate that part to "However I scream up to laughing". I would translate "I was being called by you". If we would like to translate 「名前」 explicitly, a translation will be "I was being called by you by name". The lyrics sheet and 556t say 「やっと」, not 「やった」. I have made the corrections you have suggested. Thank you for sharing your interpretation! I should consider the original theme and character context when translating.